This article is an example of using Enterprise Architect in a team. In our team of four architects we use Enterprise Architect for modelling the enterprise architecture in ArchiMate 2.0. For this government agency with approximately 1200 employees there is a large repository of architectural elements, building blocks and diagrams. These activities are embedded in the team structure and process and gives us the opportunity to cooperate in producing our architect documents and products. However one problem is hard to solve: the duplication of architecture elements. This article introduces a solution based on a automation extension for Enterprise Architect. The repository in our organisation has around 2000 ArchiMate elements stored in a relational database. The repository explorer has therefor a tree-structure with multiple layers and multiple entrypoints. For creating a model and the containing elements these is a description of an architecture modelling process, see the paragraph below. However this process is not always followed. Therefor we search for a solution to tackle this problem based on the automation model of Enterprise Architect. The modelling process has a number of steps based on the structure of the user interface in Enterprise Architect. 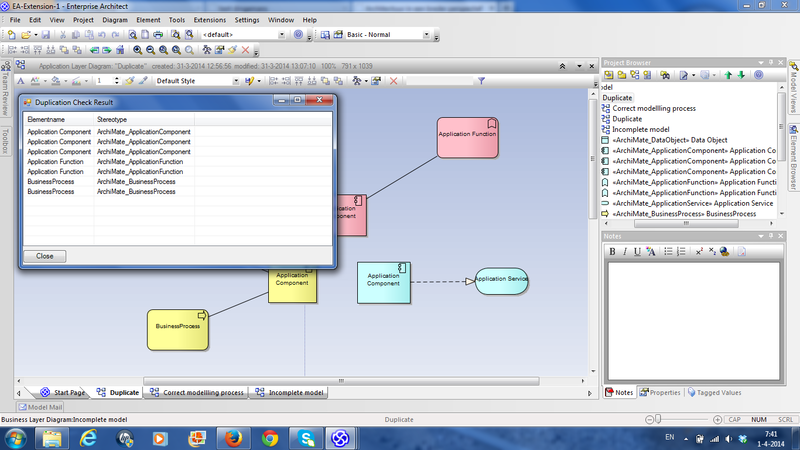 In the figure below you can see the steps of this process in an ArchiMate notation. The steps in the figure is the correct process and it includes a step to check for existence of each element in the repository before creating it. Unfortunately this correct process has an extra step which is easily forgotten when the model is created. For example in an interactive workshop with the stakeholders, the validation step is time-consuming for the architect and therefor forgotten. In the figure below you see the incomplete process. A repository which is based on an incomplete modelling process will slowly be polluted with duplicate elements and is therefor harder to maintain and use for future diagrams. To reduce this risk the following solution is introduced. After creating or modifying an element in the repository the element properties like stereotype and name are validated for existence in the repository. When this is the case the user gets a warning. In a diagram or in a package in the explorer the extension menu has an extra option for validating all the elements in the diagram or packages. When there are duplicated elements these are displayed in a overview dialog window. Unfortunalety I am a developer older than fourty and therefore experienced in VB.Net and less in C#. Howeverthere is a web converterfor C# and VB.Net that is of great assistance in this situation. See http://www.developerfusion.com/tools/convert/csharp-to-vb/ for more information. In the codesnippet a simple check is made based on a SQL statement. This statement checks for duplication on name and stereotype of the element. For ArchiMate this is sufficient, possibly for other notations another combination of attributes is necessary. The last section of the display on the screen of the validation results is handled. In the source code files of the download you can find the example. When you compile the solution in Visual Studio it is automatically registered for automation usage in the registry. For deployment without Visual Studio you have to use regasm.exe. Make sure that you use the correct version of regasm.exe, especially when you have multiple versions of the DotNet framework on your environment. The DLL is available in the BIN/Release folder and is compiled under DotNet 4.0. Furthermore you have to make a registry entry with regedit under the EA AddIns The value that you have to add points to the entry class in the DLL. The value is:DLA2EA.DLA2EAAddIn. The extension is at the moment still limited in functionality. In our organisation we are thinking about a number of extra functions like merging elements to one element based on the attributes of elements or via a user interface.